From sophisticated feminine styles to timeless classics to contemporary chic looks, faux fur coats for plus size women are fashionable, flattering and fun. You can feel great about your choice to use faux fur while still having the benefits of this luxe option in outwear. Trendy Plus Size Clothes: While not an actual retailer, Trendy Plus Size Clothes is a handy resource tool for the curvaceous women in search of a hot coat for cold weather. You'll find product details and shopping information for a wide variety of brands such as Dennis Basso, Rachel Zoe or Jamie Bryant, to mention just a few. Roaman's: Most fashion forward plus size women are well acquainted with Roaman's as they have a reputation in the garment industry for catering to the full-figured woman. Their line of faux fur coats will not disappoint you, and you can make your selection from a wide range of coat lengths and styling details. Donna Salyer's Fabulous Furs: You would swear that these fabulous furs had to be real and not faux because they are so luxurious looking. You can choose from car coat lengths to full length stroller styles, but beware. The stenciled mink parka is just too gorgeous to resist. While owning a faux fur coat may be a burning desire for you, it's important to take a few precautions before you make your final selection so you don't end up looking pudgy or heavier. Petite plus size women need to be especially conscious of the style they choose because the texture and the illusion of girth added by a faux fur can overwhelm their smaller statues, especially if they opt for a full-length coat. As a general rule of thumb, dark colors recede or make the frame look smaller, while light colors highlight or make the body look larger. 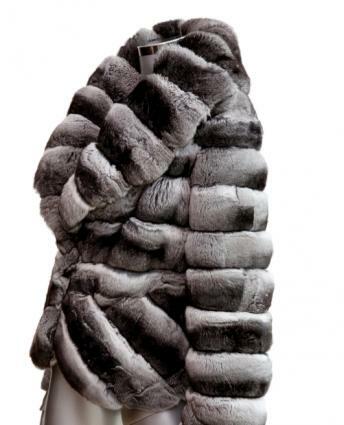 Even if you had your heart set on a snow-white fur coat, a dark faux mink or other dark shade may be more flattering. Make sure the sleeve length is proper because too-short sleeves make you look like you have outgrown the coat, while too-long sleeves make you look childish and dowdy. If you will need to have the sleeve length altered, be sure to add the alteration cost to the price of the coat to get a true picture of the total investment. Matching the coat to your body shape is important as well. For instance, an apple shaped body will look best in a coat that has a belt to break up the illusion of roundness. Pear shape and hourglass bodies can carry off shorter furs, while apple and rectangles shapes will want a coat that hits just below the hips or at the knee to create an appearance of slimness. You may want to visit a local brick and mortar retailer that caters to plus size women such as Lane Bryant or Catherine's and try on some of their plus-size faux furs to get an idea of the coat length and styling details that are most flattering for your figure. Doing this trains your eye and if you ultimately decide to make your purchase from an online source, you will have a much better idea of what to look for. A stylish cold weather choice, faux fur coats for plus size women are a great way to stay warm during the cold winter months. However, there is more to owning a fake fur coat than just keeping warm. No matter what your motivation, there is probably no garment that does more to make a woman feel like queen than a luxurious, supple fur coat. To make the most of your purchase and to enjoy the ultimate satisfaction from your investment, consider accessorizing your coat with a matching faux fur hat, gloves and boots. Pamper yourself with a luxurious coat that you can feel great about wearing.